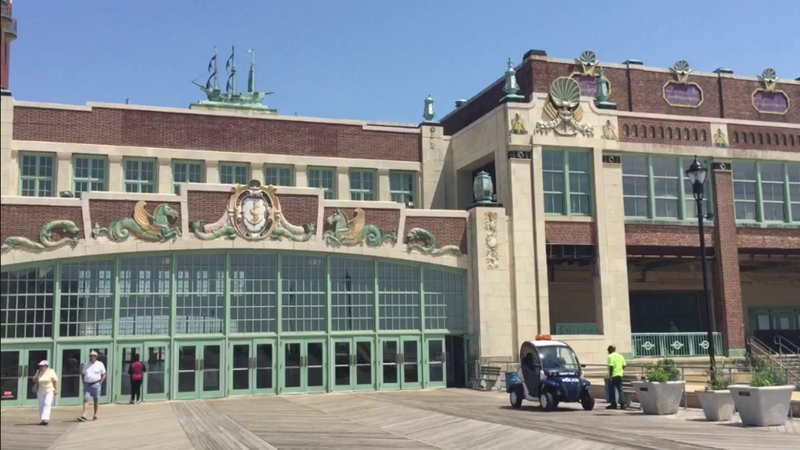 The Convention Hall, along with the adjacent Paramount Theatre and the Grand Arcade connecting the two, is one of the most majestic landmarks on the Jersey Shore. This entertainment venue has hosted performances by Bruce Springsteen, Elton John, Frank Sinatra, and the Rolling Stones, among many others. Conditions survey, laboratory testing and the development of conservation repairs to the seawater damaged terra cotta. ICR began with a visual survey of terra cotta elements on the Water Tower and extraction of cores for laboratory analysis. Microscopy of these cores revealed detachment of glaze from the tile substrate which led to a close-up investigation of terra cotta elements. The unusual glaze surface conditions identified were due to the proximity of the sea. ICR conducted water vapor transmission rate tests to inform testing and selection of appropriate patching and repair materials. Additional testing focused on development of compatible mortars and patching materials. Pigmented and clear masonry coatings were also tested to identify a coating for the terra cotta with compatible physical and aesthetic characteristics.